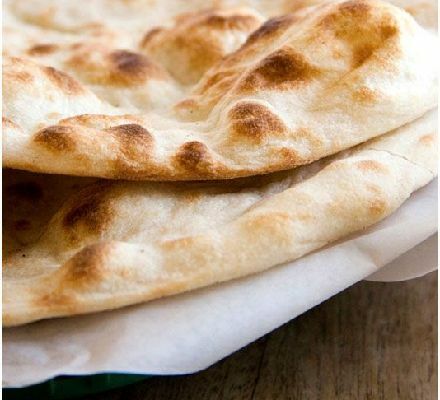 I found this recipe for Naan on BBC Good Food, and it looked absolutely delicious. How could I resist? Put the milk in a bowl. Add 1 tsp of the sugar, and the yeast. Stir to mix. Set aside for 15-20 minutes or until the yeast has dissolved and the mixture is frothy. Sift the flour, salt and baking powder into a large bowl. Add the remaining 1 tsp sugar, the yeast mixture, 2 tbsp vegetable oil and the yogurt and egg. Mix and form a ball of dough. Empty the ball of dough on to a clean surface and knead it for 10 minutes or more, until it is smooth and satiny. Form into a ball. Pour about 0.25 tsp oil into a large bowl and roll the ball of dough in it. Cover the bowl with a piece of cling film and set aside in a warm, draught-free place for an hour or until the dough has doubled in bulk. Pre-heat your oven to the highest temperature. Put the heaviest baking tray you own to heat in the oven. Pre-heat your grill. Punch down the dough and knead it again. Divide into 6 equal balls. Keep 5 of them covered while you work with the sixth. Roll this ball into a tear-shaped naan, about 25cm in length and about 13cm at its widest. Remove the hot baking tray from the oven and slap the naan on to it. Put it immediately into the oven for 3 minutes. It should puff up. Now place the baking tray and naan under the grill, about 7.5-10cm away from the heat, for about 30 seconds or until the top of the naan browns slightly. Wrap the naan in a clean tea towel. Make all the naans this way and serve hot. This entry was posted in Bread, Recipies and tagged bread, food, indian, naan on March 25, 2013 by Mind Soul.